You are a gentleman and a man of impeccable taste. I especially like the Feb 14, 1911 patent date. What better way to say "I love you" than with one of JMB's greatest creations. Carry on smartly, and happy the 1911 found a good home. Just about 3 weeks ago, I picked up a Remington Rand - the man who'd been issued the pistol in early 45 passed on, and his adult children couldn't wait to get the evil thing out of the house. If not for the intervention of one of the fathers' friends it would have been turned in for destruction by the local PD. 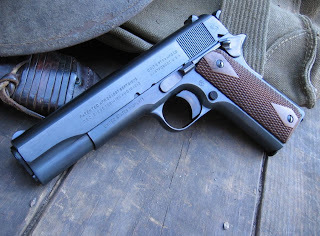 The next thing on my want list is Colts' 1911 repro, and possibly a C96. After that, I think my acquiring days are done. Wow Xav. Life is so much more interesting and satifying when you pay your way, and take care of the orphans and widows. Paul the apostle said that was true religion. That and keeping oneself unspotted from the world. You are a MAN, and I'm sure your dad would be proud! I know I am! I'd also like to think that maybe you had a helping hand in all things from above and maybe...jussst maybe,even God is a gun owner,we trust in His good name,and Sam Colt made all men equals by his firearms. ok,....Sam Colt and John Moses Browning. Congrats,I love my 1911,that dates from 1918,goose loose,but that gun still shoots great. I've hit a freon jug 4 shots out of seven at a hundred yards with it. Oh. Heck. Yeah. There's nothing like getting to help someone out AND getting to purchase a Colt WWI. I'm glad Vicki managed to find an honest man, and congrats, Xavier. My father died when I was 4 with 2 younger brothers. My fathers brothers 'helped' her out by taking many of my fathers things off her hands. She felt bad some years later when she told me that she wished she had more of my fathers to give me and my brothers. I'm glad you were able to do right by your friend. sometimes, they would choose to advertise for retail buyers armed with the information i provided them, but most of the time the sellers saw the value of receiving "cash on the barrel" and transferring to a licensed dealer thereby avoiding any liability concerns, and often they would thank me for my help and honest approach...(i took the same approach with fine estate jewelry pieces, etc.). as mr. bergeron taught me many years ago, it's easy to make a quick dishonest buck, but far more profitable in the long run, both on earth and in the hereafter, to be an honorable man and businessman. Great story, and a really great gun! I have been in posession of an original Colt Model 1878 DA "Alaskan" Revolver, since my Grandfather and Father died. I remember my dad shooting it when I was very little. It's in excellent shape.I've never fired it myself. Anyone collect them out there? Good things DO happen to good people. No doubt it was a fair price, because you are a good friend. Thank you for showing and sharing with the internet how to do it right. A friend of mine lost his father when he was young. He did leave behind some guns but was never there to pass on the tradition of enthusiasm to his son. Fortunately his mother was able to hold on to them and passed them along to my friend. Thankfully, although he has no interest in them, he is sentimental and will not part with them so maybe his son will one day inherit them. Recently he asked me to look them over and make sure they were not loaded before he moved to a new home. He has a very nice WW2 Colt, a pre-WW1 Luger along with a '94 Winchester and many more rifles. It is a fine collection, I just wish he had more interest. He did give me the 1960's can of 30-06 on Garand clips though. Good for you. It is too often that men and women of honor must pay the debts of those who are less than honorable. You are a good man and may God bless you and your family on this Easter day. How did I know you were going to do the right thing? I bought a Colt Thunderer from a friend who was sick, it had belonged to his dad, and he knew his son would pawn it off. I paid way to much for it,he has since passed on but the Thunderer has a good home. Your mother raised a fine man. You are a good man, Xavier. My father was also an avid gun collector; he had to leave us due to a horrible accident when I was just over two years old. 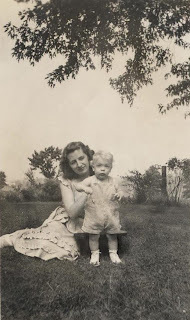 Back then, my mom knew little of firearms except that they were all over the house. In trying to keep the home safe for a toddler, she asked my aunt & uncle to come over and pack them up and take them to their house. I've no idea what guns he actually had... perhaps some were valuable, or others of the junk/trade fodder type. Eventually my cousin (their son) grew to adulthood and the guns somehow became his property. Only the desire to avoid a heavy conflict with family has prevented me from addressing the situation, and trying to get my father's guns back. An earlier poster said it well: you are indeed a gentleman. Brings small tears. I hope that when I die, my friends will do the same. Beautiful pistol, BTW. I'm glad you got what you've desired for years and I hope it helped the lady in trying times... That said, I feel bad that the boy will never own his father's firearms... Most of my Dad's guns have great stories behind them and some go back in the family for several generations... I'm sorry the boy will never inherit what rightfully should have been his. If I were Thorn I would ask for my birthright guns back. I too fell in love with the WW1 replica, it epitomizes what a 1911 should look like. Mine is brand new in the box, I took the grips off and barricaded it. Maybe one day if there is anything left of the USA my granddaughter or grandson will open the box with the same glee that you did X.